Rock School of Ministry is the discipleship school of Rock Church. It promotes individual life change in helping people discover their purpose. It fosters people to take their faith to the next level, discover who God made them to be and get empowered to do what they were created for. 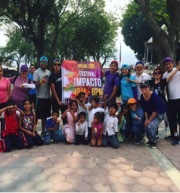 In 2015 the Villasenor Family traveled to Oaxaca, Mexico and began “Impacto”, a Rock School of Ministry campus. Here are the stories of two students whose lives are being transformed! Sebastián is one of our Generation 3 students of Impacto... He will be entering his last term this September. This is his story! 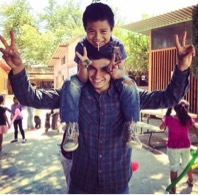 My name is Sebastián and I would like to share with you about my first mission trip with Impacto. For me, this trip was the first time that I ever spent more than one day with a group of people, and that obviously comes with new experiences. Many of those in our group come from different backgrounds and life experiences. We all had different character traits, personalities, and habits, which are different than what I am used to being around in my daily life at home. God used all of these things to work in my life. You may wonder, "In what way?" I found the answer in 1st Timothy, chapter 5, verse 1 through 2. "Do not rebuke an older man but encourage him as you would a father, younger men as brothers, older women as mothers, younger women as sisters, in all purity." There were so many times during the week that I would get so annoyed at all the questions and complaints, the mixture of yelling and laughter, all of which added to the noise that I was unfamiliar with. I wasn’t annoyed with the people, only with the fact that I was in an environment I was unaccustomed to. And the only way I could love these people in all purity, like 1 Timothy says, was to "pray for them," as I heard the Lord say to me. And not for more patience with them, but for more love. Today I can say that God has brought me to a deeper level of love for others. Over this trip, I learned how to communicate and love my community better. Ammi is a third generation student at Impacto and will be entering into her last semester in the discipleship program. She was part of the very first international mission trip to Colombia that Impacto has ever had! Here is her story! Well, I believe those things actually did happen. Yet I also felt like there was some disbelief in me that I wouldn’t be able to do things for God. From the moment we prepared for our trip to the time we arrived in Columbia, I had such a strong feeling that I was incapable to complete the mission at hand. I began to get frustrated because I felt like I wasn’t enjoying the trip as much as I saw the rest of my team enjoying it. I didn’t realize it at the time, but I was in the midst of God moving in my heart and changing how I felt towards the people of Colombia. During our second week in Colombia, we went to a place called Choco. It was a place with extreme heat and humidity and no clean water whatsoever. Upon arriving at this village, I knew that God had something special in store for this place. As I began to get to know the people of this village, my love for them grew more and more. I was so surprised and could not understand how God could take me to a place so out of my comfort zone, a place I would have never chosen to go on my own and give me a heart of love. I realized that it everything comes down to love. That in the end it’s not about what I can or can’t do, it’s not about my gifts, talents, or capabilities, but it’s about having an open heart to God. Allowing him to do whatever he wants in me and through me. I can see how God is a strategic God. He has big plans for my life and nothing passes him by. He never misses a thing. Were you moved by the experiences of Sebastian and Ammi? Thinking about going on a short term missions trip? You can check out more about the trips the Rock is offering as well as the Oaxaca team and impacto school below.